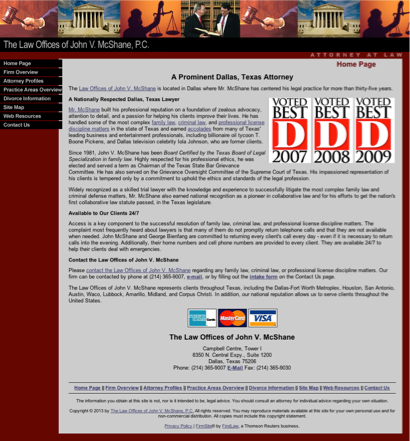 Mc Shane, John V - Mc Shane & Davis (Lawyers) is practicing law in Dallas, Texas. This lawyer is listed on Lawyer Map under the main category All Law Firms in Lawyers. Mc Shane, John V - Mc Shane & Davis is listed under Lawyers in Dallas, Texas . There's currently no information available about fees or if Mc Shane, John V - Mc Shane & Davis offers free initial consultation. The information below about Mc Shane, John V - Mc Shane & Davis is optional and only visible if provided by the owner. Call (214) 365-9007 to learn more. Contact Mc Shane, John V - Mc Shane & Davis to find out about hours of operation / office hours / business hours. Listed business hours are general only. Call (214) 365-9007 to learn about office hours. john v. mcshane john v mcshane john mcshane texas tx dallas fort worth ft. worth houston san antonio austin waco lubbock amarillo corpus christi lubbock midland frisco mckinney highland park university park dallas county collin county tarrant county denton county family law divorce divorce lawyer custody custody lawyer collaborative law collaborative family law criminal law DUI DWI alcoholics anonymous professional license discipline matters texas state bar grievance committee texas board of legal specialization lawyer attorney law firm attorny atorney attornies lawer laywer dallas best lawyers texas best lawyers best family lawyer super lawyer d magazine texas monthly boone pickens t. boone pickens judge dee miller iola johnson.